LEFT is extraordinary physical theatre with heart. The exemplary skill, focus, commitment and ensemble work of every performer builds a living metaphor of community. 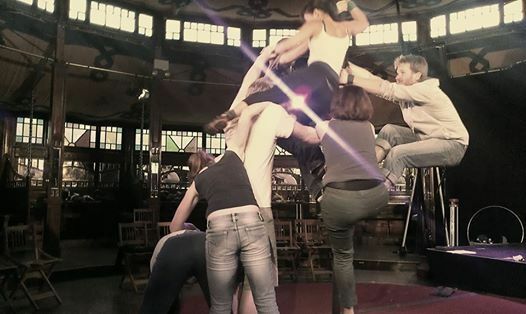 They demonstrate trust, risk, and the spirit of circus which pushes boundaries, shares pleasure in the achievement of the almost impossible and generates audience inclusion. It is wonderful to see the rich variety of technical brilliance, but what fully draws the audience into this performance is the connection between members of the company, their portrayal of a journey of loss and individual’s and the group’s adjustment. The performance is structured in episodes of entertaining physical theatre interspersed with ‘games’. The performers all have highly developed specialities across the major circus skills which they put at the service of the troupe. Each has their moment to shine and the focus and efforts of the others supports them. The necessary equipment is managed without intruding on the performance and the sound and light support is unobtrusive and effective. This is a rich experience which attests to the hard work, skill and heart of the troupe and is a satisfying melding of the best of theatre and circus.